Tournament just started. We were told that bbo_iac username will be able to log in with old window client, until we are given similar privileges in web (to add/delete members, chat to club etc). With DIRECTOR tab (1) checked, you get message that tourney just started. All our TD tools are in the ACTION drop-box (2). Click there. Again, all tools are pretty much self explained. Clicking on SHOW TABLES takes you there, independently where you were when trny started. Note chat area. To speak to whole tournament, click on it (3a). To speak to any player privately click on their name and type chat at the bottom of their profile. When you enter the table, you&apos;ll have several chat options, make sure you select one you need. 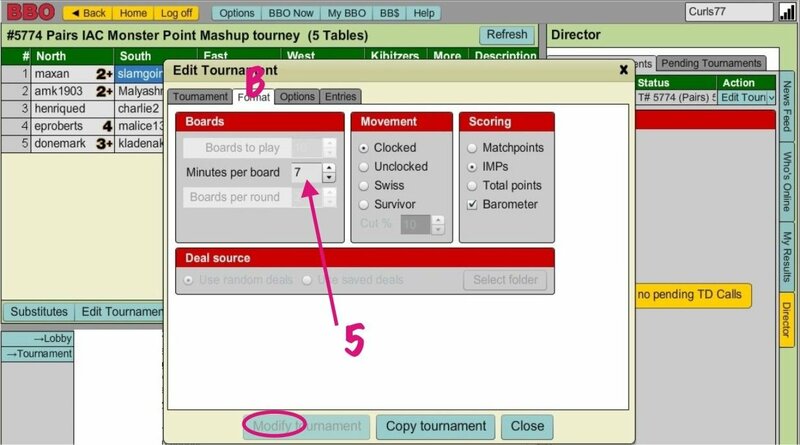 So, select Tournament (3a) to give your rules - all players and kibs of whole trny will see that. 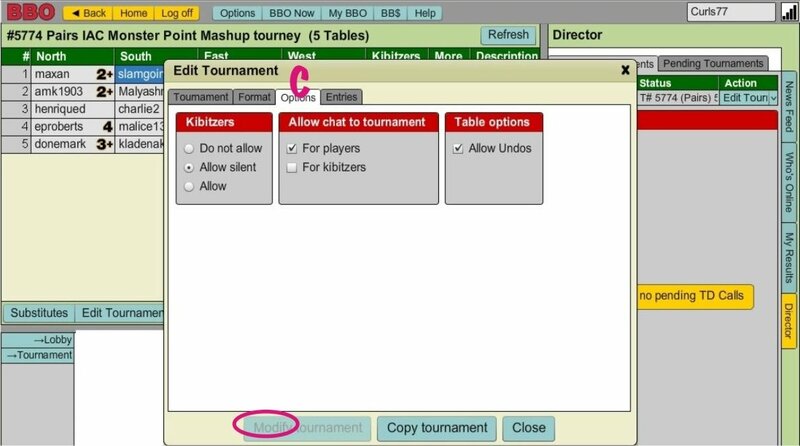 When you enter some table, TABLE chat (3b) is defaulted, typing there will be visible to all players and kibs of that table only. 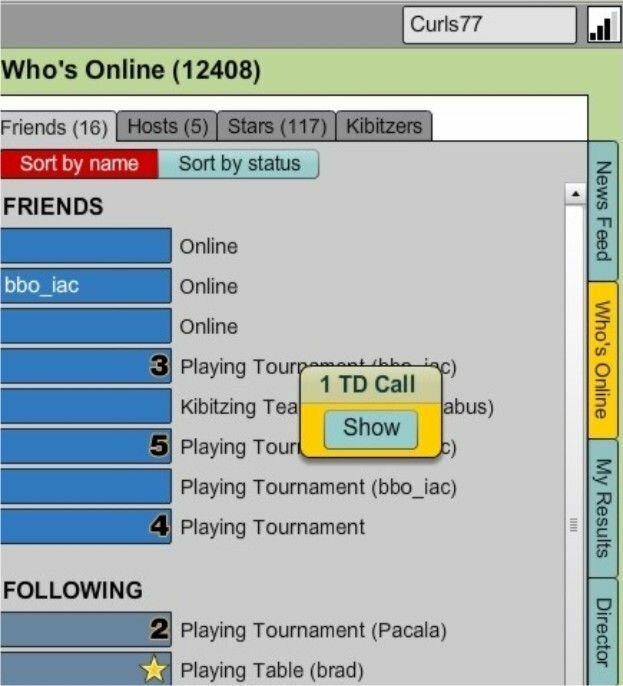 Obviously, selecting Kibitzers instead, chat will be seen by kibs only, not by players. OK, lets look at our tools more closely. 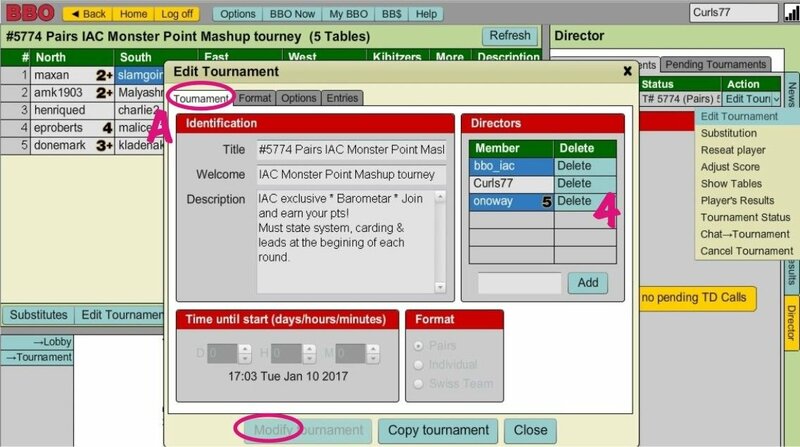 Clicking on EDIT Tournament opens the window we used when we created or modified trny. And lets not forget hit MODIFY button, so change is assumed. In FORMAT tab (B) you can add extra time. 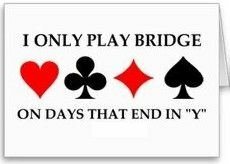 If you want to give extra min (per board)change 7 to 8 (5). Do NOT forget hit MODIFY whenever you make some change. At any time later you can go back there and put it back to 7 mins. That&apos;s eveything about EDIT tool. CHAT opens a box to type something to the tournament, but you can do it from the chat area as well, rarely used tool. Another rarely, if ever used tool is CANCEL, that will delete tournament in progress. If you click it you&apos;ll be asked twice if you are sure you want it deleted, so it is hard to delete it by mistake. Next couple of shots what STATUS tool gives, while other tools will be described in other pages. 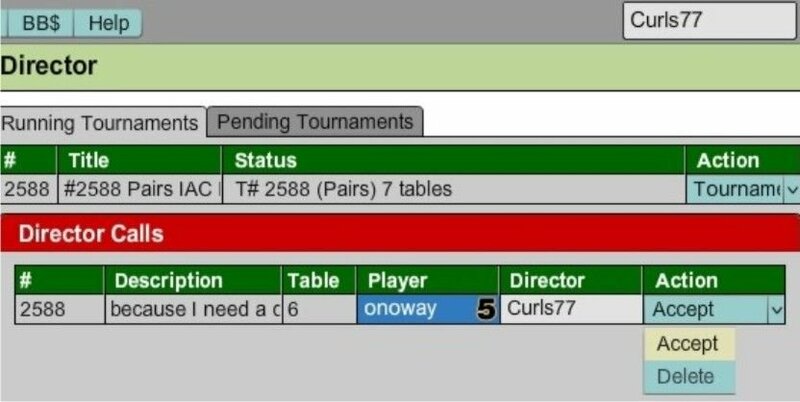 Note that I am there in my own nickname, Curls77, but in web BBO we see ALL calls placed to any TD of current tournament, as one placed to bbo_iac. 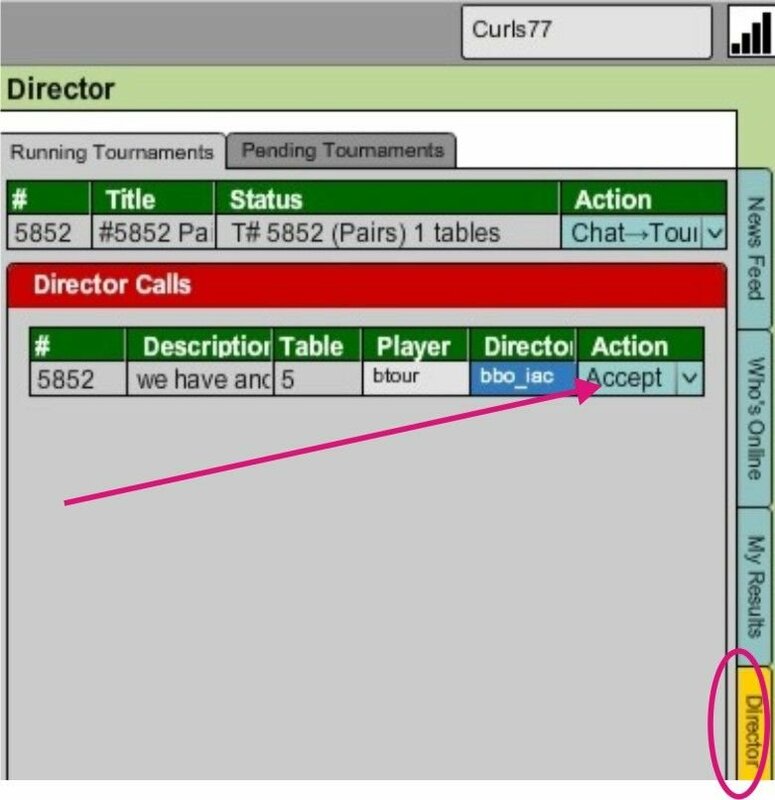 Hitting ACCEPT takes you to the table, and gives you message of why TD was called (description player gave). Call disappears once it was accepted. If your DIRECTOR tab is not selected, but instead MY RESULTS as you are at some table, or even WHO&apos;s ONLINE, you get a this pop-up. Clicking on SHOW, opens DIRECTOR tab and shows you who was called and why.